DHARNA NOOR: Welcome to The Real News Network. I’m Dharna Noor, joining you from Baltimore. This weekend, thousands of people are expected to hit the streets in the nation’s capital and other cities, from New York, to London, to Nairobi to fight climate change. The rallies have been organized by a group of teenagers who are here to say that for the climate crisis, this is zero hour. The world cannot sustain an action on climate without catastrophic consequence. 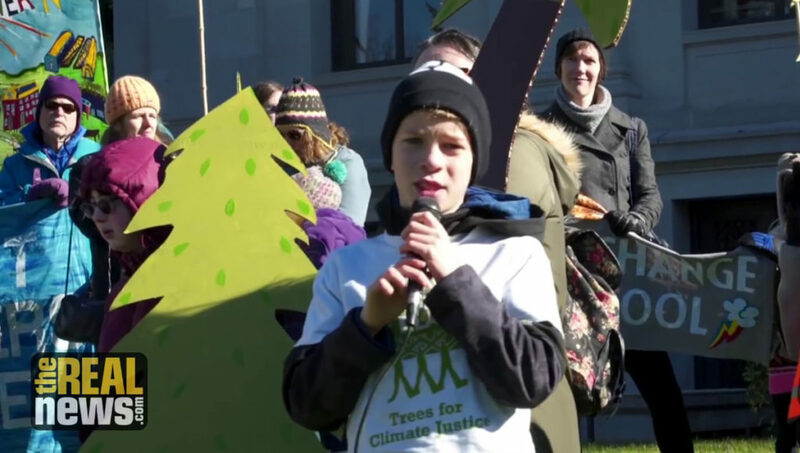 Many speak about a need to stop climate change to protect future generations, while at the Zero Hour Climate March we’ll hear from the next generation firsthand. Well, with me to discuss this is two organizers of the Zero Hour Climate March. They’re both joining us from Washington D.C., where they’re holding a lobby day. More on that later. First we have Nadia Nazar. She’s one of the founders of Zero Hour, and she’s the group’s director of branding and partnerships. She’s 16, and she’s actually based here in Baltimore. And Talia Grace is the group’s director of social media. She’s 15, and she’s based in Seattle. Thanks for being with us today, both of you. So you know, there are so many political issues that really touch young people’s lives. So why did you all choose to mobilize around climate change? Nadia, I’ll start with you. NADIA NAZAR: Yes, so, we are mobilizing for climate change mainly because this is about our survival, because Generation Z is going to be the generation that is most impacted by climate change, and we’re going to have to take the burden that we did not decide to make. So this really is an issue of survival. And it’s also a really urgent issue. If we don’t act now then there’s going to be no hope left. So we really, this is a really urgent issue. We have to act at this time. We can’t act in 10 years, in 20 years. This is not an issue to put aside. So we just want to live, have a livable future, a livable planet, and have clean air and clean water for our generation. DHARNA NOOR: Yeah, and the stakes for this are really high. We just saw the third hottest half year since 1880, according to a new study from NASA Goddard and Columbia. Three of the last four years saw record breaking temperatures. This month, a third of the globe experienced a heat wave. And every study shows that all of the results of this will be, you know, more extreme weather, compromised food production, the creation of more climate refugees. And I understand that you’re holding a lobby day in D.C. to demand that elected officials take real policy action and make real policy changes to address all this. Talk a little bit about your demands of those politicians. We know that groups like the Koch brothers spend millions of dollars to lobby politicians to act in their interests and the interests of the industry. Talk about how you’re going to combat that. TALIA GRACE: Yeah. Our demands of our elected officials, we have quite a few of them. You can read them in full on our website, our full platform. But the, the main important ones that we want to focus on is to ask that our elected officials stop accepting the corruptive money from the fossil fuel industry, which is very dangerous. I mean, like you were saying, the Koch brothers gave so much money to the government that it makes very difficult for advocates like us to get through to our elected officials on issues surrounding climate change. So that’s a big one. And we also have, we also have a pledge, a no fossil fuel pledge, that we are going to ask all of the congresspeople that we’re speaking to tomorrow to sign, and see if they’ll stand with us in solidarity with the Zero Hour movement. DHARNA NOOR: And you’re lobbying not only Republicans, but also Democrats. Why? I’d like to hear from both of you. What’s your relationship like to this two-party system? Nadia, maybe we can start with you. NADIA NAZAR: So, myself, I’m an independent. But we are lobbying for both parties because climate change is an issue of survival. It’s not, it shouldn’t be a political issue that’s only for one, for one party. Climate change is an issue that the whole government should be acting upon. So we really are talking to everyone that we can to see, because we need the most change. And I think that there’s a lot of the issues that are considered really, you know, they’re partisan, and that when Congress votes on them it’s just on either side of the aisle. But this isn’t an issue that can be split with party lines, because when we’re facing catastrophic storms and floods and fires, it doesn’t matter whether you’re a Democrat or Republican. Your family is still going to lose their home. You still may become a refugee. You still may be facing a mass extinction, regardless of your political views. DHARNA NOOR: And in addition to that, it’s not only Republicans. It’s also Democrats who often are taking money from fossil fuel industry representatives who are acting in the interests of this extractive economy. And your policy platform really addresses that. It’s really comprehensive. Amongst many other things, by 2020 you call for the protection of First Nations treaty rights, rejoining the Paris climate accord, imposing heavy taxes on the worst emitters. By 2030, you demand a 10 percent reduction of greenhouse gases every year for 10 years, amongst many other things. How are you getting politicians to sign onto this, and then how are you holding politicians accountable? Especially, how will they be held accountable in the elections, come 2020? 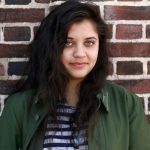 NADIA NAZAR: [Inaudible] the urgency of this, and our platform is very well-written and it is, it is filled with solutions that we need to take in order to solve climate change. And so we were trying to tell our elected officials or senators that we’re speaking to tomorrow that this is an urgent issue and that they have to act upon it, or else people are going to die. And it’s an issue of survival, again, and it’s something they should care about, their constituents and the lives of future generations. And we will, we will be creating that urgency on Saturday at the Youth Climate March in Washington D.C., and all around the world. TALIA GRACE: Yeah. I would add to that, and I would say that we’re an intersectional movement. And a huge focus of our platform is to focus on the systems of oppression that are huge contributors to climate change, because minority communities are so often the ones that are most affected by climate change. Whether, you know, in Puerto Rico during the hurricanes last year, or communities in poverty in the United States that have fossil fuel plants near them, or coal mining. DHARNA NOOR: So talk about why people should listen to-. Why people should listen to you, why people should listen to kids. What do young people have to add to this conversation, and why should we specifically be listening to y’all? NADIA NAZAR: Yes, so I think we should listen to every, everyone, regardless of who they are, we should be listening to everyone. And that’s something that we’re not really doing right now. The youth are kind of shunned away, and they’re kind of seen as too immature to have opinions. And so it is important for us to speak our voice, because we’re not able to vote. So we’re we’re trying to find other ways to get our voice out there. And so we need to make sure that everyone’s in the conversation. People of color, LGBTQ, and we really need to make sure that everyone is in the conversation. But youths especially are on the front lines of climate change, and our generation is going to be the most impacted by climate change. So people should listen to us, because this is about our survival, and we want our voices to be heard. TALIA GRACE: Yeah. I agree with that, and I would add on that I think a lot of times in the climate movement you hear older activists saying that we’re fighting for the next generation. They’re fighting for their kids, for their grandkids. We’re fighting for ourselves. This isn’t something that’s going to affect us 70, 80 years in the future, or it’s going to affect our children or our grandchildren. This is going to affect us. Our futures, our careers, our lives. So it’s, it’s a more immediate issue than a lot of people talk about. Now we’re out of time. DHARNA NOOR: What are your plans for after the march? What happens to Zero Hour after this week, after the art builds are over, and the lobby day this week, and the marches, what happens after that? NADIA NAZAR: Yes, so we are a movement. So we are continuing, continuing this power and this energy, and we’re only here to create change and to inspire and motivate people to create change, as well. So we will be taking actions after the march, especially because of this upcoming congressional election. We will be, we will be trying to get voters out and make sure that people vote for elected officials that won’t take money from fossil fuel companies, and that will actually [inaudible] on climate solutions. TALIA GRACE: Yeah. I would add onto that, and remind everyone that Zero Hour isn’t-. The climate march and Zero Hour are connected, but Zero Hour isn’t exclusively the climate march. We are an organization as a whole. So when the march is over, it isn’t going to be the end of this movement. We are going to continue to take action, because one march isn’t going to change everything, and we still need to, like Nadia was saying, we need to lobby our elected officials and make sure that people who are elected to office are people who have interests that are in the common good, and that will help us and help us have clean, healthy, livable futures. DHARNA NOOR: OK. Well, I’ll see both of you at the Zero Hour Climate March in D.C. Again, there’s a number of sister marches taking place across the country. So we’ll keep following this, and we’ll be sure to check in with you. So thanks to both of you for coming on today. NADIA NAZAR: Thank you for having us.